Got to find a cheap body first and finish 3 other projects. Might make a bird house out of the acoustic body. These free parts are going to bankrupt me. I've always thought something Mustangey or Jaguarey with a square, three on a side headstock would look cool, like a really strange copy of something. Wow, where did you find that neck? Do you know what it's off of? 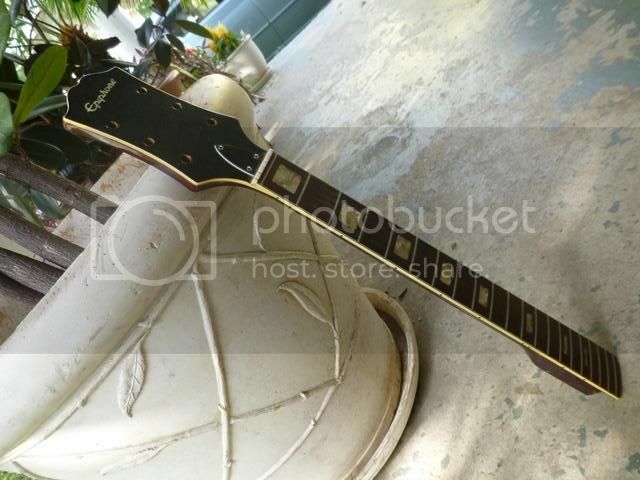 Never heard of a 24" scale Epiphone neck, especially with the book headstock. Neck salvaged from a free trashed Epi Acoustic. My guess is early '70s Japanese built (Matsumoku?) headstock is same as ET270 and similar. I'm surprised at 24" scale though, I would expect a touch longer. are you building the body? So far I'm using parts bodies, miles from any kind of precision set up for making stuff, hell I work out of my dining room. From the zero fret to the 12th is 12 inches, Oh and it will need a refret, deep grooves tapering off at the 7th fret. I can do a refret in my dining room. I'm still very new to all this tinkering, two refins and some light modifications. 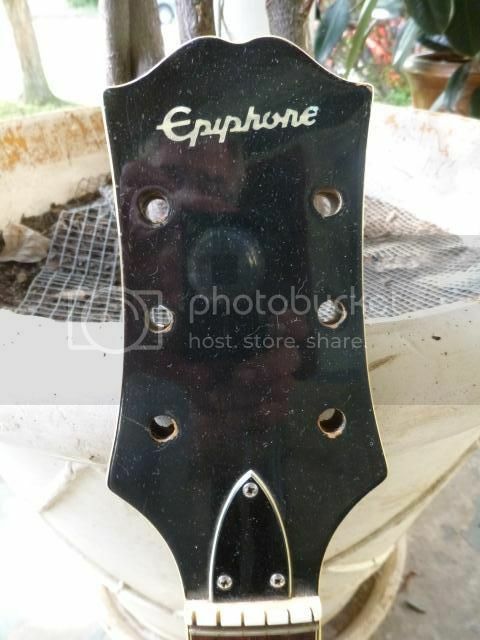 The neck came off a Kalamazoo Epiphone body, made in Japan, I don't know if it was original or if somebody blocked off the end and bolted it on. I don't see any marks for a glued neck heel on it, there's a 6830 on the sticker and a No. 107735. Mile high action, played and sounded horrible, one of the braces was loose. As I said the guys at my local guitar building club (the East Tennessee Luthiers Guild , they'll let anybody in, great guys) said it was unredeemable. I've got one Ibanez shredder body I cut the horns off and reshaped, that might be my strategy to get a Mustang or Corvette shape, I'd need full sized templates to see what could be adapted. Or if anyone wanted it I might just part with it, it will be a few years at the rate I work. Apparently I can use my fret leveling block as a planer, I've got several 2X10 pine boards. If I go that route it will be a Corvette body, nice if I could do a Mustang or Jag trem on it.